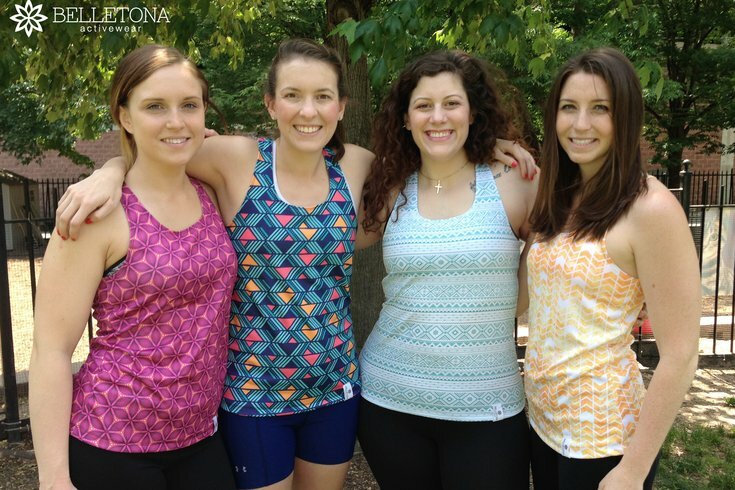 Belletona Activewear, as modeled above, is a newly launched line of women's performance tank tops. As families begin back-to-school shopping and out-of-school adults find nostalgia nudging them to the mall, one industry is almost surely losing out: denim. During a time when many shoppers would turn to the tried-and-true American staple, just as many are buying up yoga pants, sweats and flashy sneakers instead. It appears the "athleisure" trend - where activewear makes its way out of the gym and out to dinner - is here to stay. In other words, no, it's not just you and your friends who wear Lululemon yoga pants to brunch and to go shopping and to the grocery story and to grab coffee and to bed. In fact, brands as varied as Abercrombie & Fitch, Urban Outfitters, Ann Taylor Loft, Victoria's Secret and Tory Burch have all jumped on the athleisure bandwagon of late. Lululemon recently launched a line of activewear for kids. Karl Lagerfeld, who once said "Sweatpants are a sign of defeat," launched a sportswear line this year. Levi Strauss' senior director for technical innovation Bart Sights won't even say the words "yoga pants" as the legacy brand tries to toe the line between "jeggings" and jeans. But for every fashion designer and celebrity who embraces the trend, someone writes that half of all athleisure fanatics are just lazy or that it's all one big "I go to the gym" humblebrag. Sure, throwing on sweats and sneakers is really easy, but the trend is about more than just comfort. For starters, the ability to wear one outfit to the gym, the office and after-work drinks is a major plus for those on-the-go. High-tech moisture-wicking performance fabrics make it easier to keep up with a busy schedule without needing to switch outfits for every occasion. For stylist Karima Renee, below, this busy-bee lifestyle almost requires this type of multitasking wardrobe. "Our lives have gotten increasingly more hectic. We're doing so many things in a day that comfort is key," Renee said. Though she's personally a heel-lover, even a fashion-forward woman like Renee sometimes throws on some flats. "I'm pulling clothes, going to a shoot, to a lunch, to a meeting, to the gym, so it's important that my clothes move with me, that they're breathable, that they look good and feel good," Renee said. Jillian Skovran, owner of the newly launched brand Belletona Activewear, feels the same way. A former college athlete, Skovran and her friends lead active lifestyles and they're always on the go. "If we’re running errands or we go grab lunch, it’s comfortable. We’re comfortable with each other and we want to be comfortable in our environment," Skovran said. That's why Skovran decided to use her knowledge of sports apparel to create a line of performance tanks in bright, fun patterns that epitomize the athleisure look. They'll keep you cool on a long run, but they're also great for girls' day out. 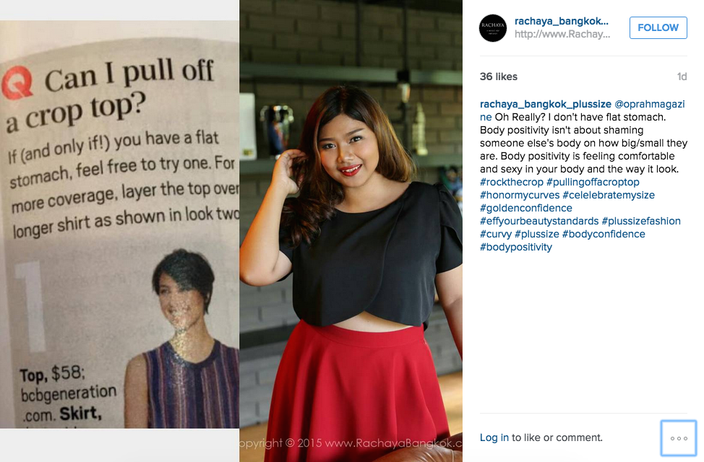 But still another reason that athleisure has caught on may be getting overlooked: the rise of body confidence. As the ubiquity of social media has increased, so has the community of users finding peace with their bodies and redefining beauty standards. For every negative social trend like "thinspiration" there is a confidence-boosting one like "strong is the new skinny." Rather than let body shaming proliferate, men and women are standing up against anything that promotes a singular type of beauty. When an O, the Oprah Magazine article claimed crop tops are only for women with flat stomachs, women of all sizes began posting photos of themselves in crop tops marked with "#RockTheCrop." When Instagram recently banned "#curvy," the Internet went up in arms and many boycotted the site until it was reinstated. Not only is activewear symbolic of a healthy, fit lifestyle (or at least the perception of one) but it is also projects confidence in one's body, no matter one's shape. It takes a lot of chutzpah for anyone to dress in head-to-toe spandex and not want to hide under the covers. But combine close-fitting clothing with the satisfaction of feeling healthy and happy with your body and athletic wear becomes empowering, not scary. "We all have issues with certain areas of our bodies, but now you don’t have to be Gisele Bundchen to wear this kind of stuff," Renee said. If anything, athleisure is emphasizing the many sizes and shapes humans come in just as the body positivity movement kicks into high gear. Like many women joining both trends, Skovran agrees social media can be an inspiration when it comes to feeling confident. "I know I follow a lot of different girls that help motivate me," she said. "Seeing their stories and how they view themselves, I do feel like since they’re positive about their bodies that it will lead other people to be." While the chic set laments the death of dressing up, athleisure may be doing more for body confidence than years of strict fashion rules and runway models ever did. The body-positive nature of the activewear lifestyle may just be what is attracting consumers away from an industry that often prides itself on exclusivity and conformity. It only makes sense that a generation that embraces uniqueness and acceptance would want it hanging in their closets.